Discussion in 'Pictures & Stories of My Chickens' started by Drk_Wlf, Jan 7, 2011. 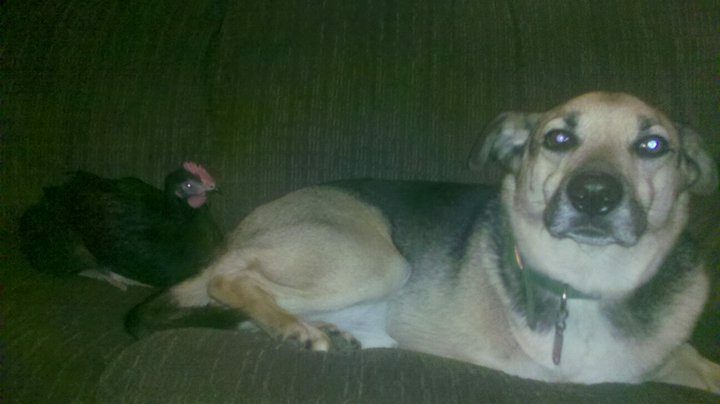 My beagle/german shepherd Keegan just loves our chickens! I have caught him IN our chicken coop multiple times and our rooster seems to be ok with it. We have a batch of chicks that are a few months old. One of the little cockerels is SUPER friendly so I bring him into our living room sometimes and he will hang out on my lap while I watch tv. Keegan seems to have become particularly found of this chick, who we named Dumpling. Every time I sit on the couch with the chicken Keegan will jump up onto the couch and sit next to us. It is so cute! I don't know what I am going to do when it comes time to butcher our extra roosters, I might end up giving Dumpling a pardon. Pardon the Dumpling! Pardon the Dumpling! Quote:My husband keeps saying it a hen! but I am 99% positive that its a roo. We will probably end up culling our older roo and keeping Dumpling around, just cause he has such a great personality. Hopefully he will stay sweet, his dad is pretty well behaved to but was never this cuddly. Look at how he adores Keegan! Pardon Dumpling!! The poor Dog will be heart broken if you don't!! 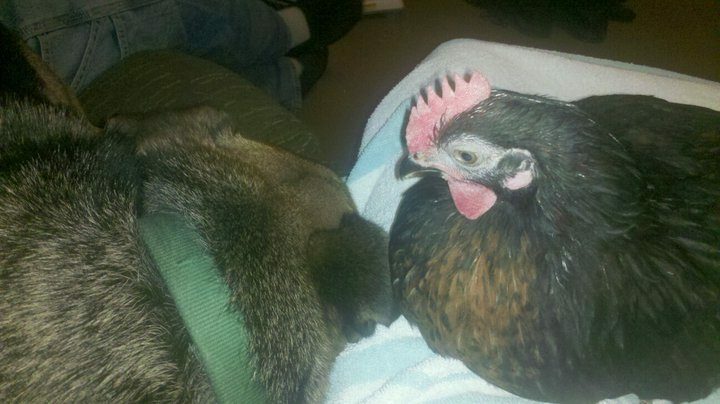 We had a sick hen and we would put her outside on sunny days, and our dog would sit next to her all day. Poor the was so sad shen she died.